I’ve never understood the bolded bit there. Tolkien is saying that Sauron sometimes sent prisoners to Shelob to keep her less-than-ravenous and in check, in an almost playful way, the way you might throw a dainty to your cat. So clearly Shelob is the cat. But then why does it say, “but she owns him not”? Surely if she were the pet and Sauron the master, as seems to be the explicitly denied premise, he should own her, not the other way around. Was Tolkien one of those cat-lovers who say that you never own your cat—your cat owns you? I don’t know why, but I’ve always assumed that was a much later jocular meme. Is there some other logical explanation for this seeming reversal of ownership? According to a similar discussion on another site, Tolkien is using "own" in a more archaic sense of "acknowledge" or "yield to." The Oxford English Dictionary article on own contains one definition (4.c) of "own" as "To acknowledge as having supremacy, authority, or power over oneself; to recognize or profess obedience to (a greater power, a superior, etc.)." His pet he calls her, though she doesn't recognize his authority. His pet he calls her, though she doesn't agree. He owned his child before the entire assembly. They owned the king as their lord. The one who did it had better own up. I own to being uncertain about that. 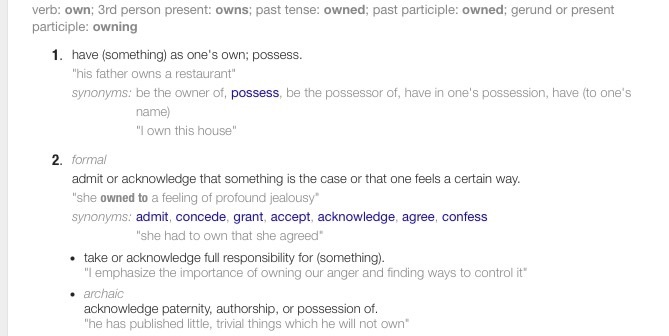 In this case, "own" means "admit" or "acknowledge", not "claim possession of". So the sentence isn't saying that Sauron doesn't belong to Shelob, it is saying that she doesn't acknowledge that she belongs to him. Or to use the example from my quote under the second definition: "She did not own [i.e., acknowledge] him as her lord". Another possibility is that Tolkien was using not an archaic version of "own", but an ironic notion - common to cat lovers and haters (with Tolkien strongly established as the latter) - that "really", it's the cat owning her human, not vice versa. Even more ironically, that humorous slant seems to be more true than not. Science FTW! Not the answer you're looking for? Browse other questions tagged the-lord-of-the-rings tolkiens-legendarium language-explanation or ask your own question. Why did Sauron not notice the Phial used by Sam to defeat Shelob? Why didn't Sam use his own sword after dropping Sting in the fight with Shelob?